The charm and beauty of our Vivenda Miranda makes it the perfect venue for your unique wedding. 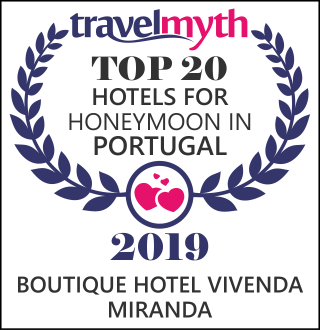 Set amidst colourful Mediterranean landscaped gardens over the natural dramatic cliffs of the Western Algarve, our boutique hotel enjoys spectacular views of the Atlantic Ocean, stunning coastline and endless sky. The Vivenda Miranda is also available for your private exclusive use. If your idea of the perfect wedding is a more relaxed, rustic affair, why not look at our country house the Quinta das Barradas. Situated in the lovely countryside of the Alvor valley amidst rolling hills and gently swaying trees the beautiful Quinta could be your ideal venue. Our wedding support team would be delighted to discuss and assist you in organising your perfect wedding. So talk to us about your preferred dates as soon as possible to avoid disappointment! We offer you varied menu options based on our traditional, authentic, organic and locally sourced food. We call it Artisan Gastronomy that allows you to celebrate your personal beliefs in a caring, environmentally conscience place of uncompromising quality and in style! The Vivenda Miranda Residence is available for weekly hire or a minimum of just two days including accommodation for a maximum of 50 guests including all services and wedding planning support. The Residence comprises 24 rooms/suites, split between two buildings surrounded by beautiful gardens boasting stunning sea views. Full restaurant service for the duration of your stay is available as well as use of the sauna, steam room, spa pool and an extensive range of relaxing treatments in our organic Neal’s Yard Remedies Spa. Here at Boutique Hotel Vivenda Miranda we had our Dream Wedding. It was GREAT. The hotel is breathtakingly beautiful and the ambience simply stunning. We enjoyed our big Suite with the terrace and the ocean view, with all that lovely details. Organising the wedding from Germany was very uncomplicated. All our wishes were realised extremely professional. The food was delicious, our guest overwhelmed and we simply happy. Ever wondered how it would look like having your dream wedding in one of the most stunning locations of the Algarve? Well, just have a look. If you are looking for a beautiful countryside venue for your special event, you need look no further that the Quinta das Barradas, our country house estate. Relax and celebrate with your guests within our lovely rural surroundings. Does your extended family need the perfect place to meet up and celebrate an important event or just a beautiful place to get together? We provide beautiful celebrations of uncompromising quality, allowing you to celebrate in style. Vivenda Miranda offers the ideal informal environment for high-end business events such as, private business negotiations and meetings, company presentations and incentives, team building or product promotions. The natural beauty and stunning position of Vivenda Miranda makes it the perfect location for film, advertising or photographic shoots. Our property has on many ocasions provided the backdrop for a variety of commercial promotions including; fashion shoots, TV shows and TV interviews. We already work with several leading coaches and therapists in their respective fields to provide them with the ideal venue to host creative fitness, health and wellbeing courses or breaks. So if you are looking for the perfect place to bring your group why not contact us?